London 2006 Emetrics Summit, Web Analytics Conference. Are there standard definitions of Web metrics? Can we specify benchmarks for Web success? What metrics can justify Web-based projects? How do you confirm the most valuable customers? How do you calculate the ROI of personalization? 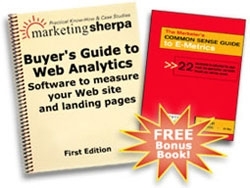 How do you calculate the value of Web intelligence? The Emetrics Summit is designed to continue the industry dialogue. Senior Web executives, focused academics, software and service vendors, and members of the press will work together to identify and address e-metrics issues. How do you establish a Web metrics baseline? How do you correlate offline and online metrics? Which criteria apply to which types of Web content? How do you correlate customer satisfaction data? The Emetrics Summit is a working session. Several presentations will help set the stage, but the participants will set the agenda. It is a gathering of thought leaders designed for interaction and discovery, not for lecturing and note taking. There were many words of praise for previous Emetrics Summits. What happens if you do not measure the success of your website?